Considering "all the rave" about EDM (credits to my friend, Ashley, who thought of this witty pun), there must be something more than just the beats and the ever present drop. I tried looking into this type of music and the music festivals that it's played in, and judging from the jumping everyone does, it seems to be very enjoyable. I've only ever been to one "rave concert" so I can't exactly call myself a party goer/concert goer/whatever you call it. What's best about these is the unity the crowd immerses itself into for the love of music... and for dance, sometimes. With this in mind, De La Salle University’s most outstanding organization, Economics Organization proudly presents its first ever festival: the 11:11 Music Festival! It is the first college music festival to merge OPM with EDM. Imagine Tadhana by Up Dharma Down with Animals by Martin Garrix!? It may sound weird, but you can't judge what you haven't listened to yet. Also, the name "11:11" isn't just out of a whim. It's for the wishes that have yet to come true and in this concert, at 11:11, hundreds of LED Balloons will be floating in the sky. How's that for a metaphor for wishes? The festival will start off with Banna Harbera, Stories Told, WeeFee, and Chasing Victoria. Then come Urbandub, Franco and Paraluman, who will all sing their hits and discover new music from that of Between Archery and Olympic, Autotelic, Identikit, Flying Ipis, and Never the Strangers. End the night by raving to the beats of DJs Rammy Bitong, Benedict Pacia, Edleen Lim, Curse & Bless, and Ace Ramos! 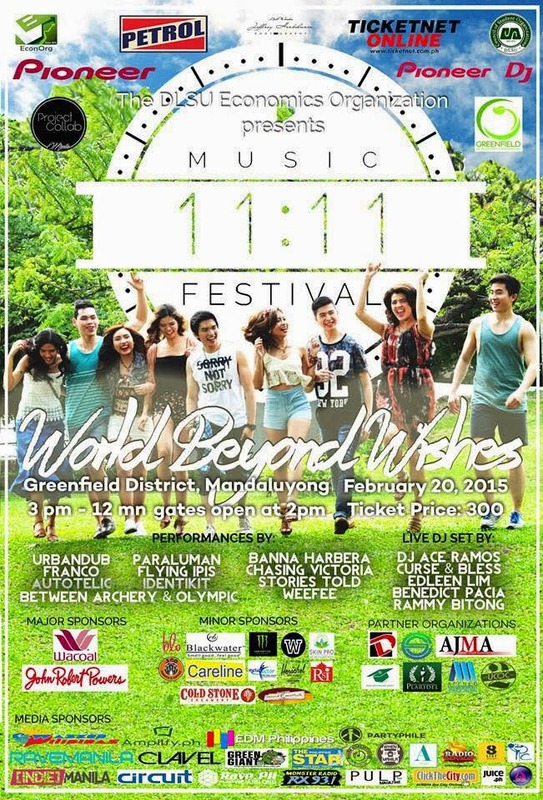 So, set yourself free (because that's the song I attached to this) at the Greenfield District on the 20th of February, 2015 and enjoy a night filled with fun, music, fashion and wishes. Though I won't be there because of school reasons, I do hope you all get to go! But if ever, I did get to go this would most probably be my outfit (hehe, blog post to make up for my absence)! Don't miss out on this event, which I know for sure would be worth going to. For more of 11:11 Music festival’s details please visit their Facebook page, follow their Twitter page, follow their Instagram account to witness one of the biggest college music festivals in the making.